Designing your own clothing can be daunting, especially when you are finally ready to manufacture! Making apparel is a group effort, so we work with you every step of the way to ensure that the final product is your dream come to life. There's nothing more frustrating than brand-new clothing fraying after the first wash. We believe that quality should never be a compromise. No matter what type of design you're looking for, we guarantee durability. We want you to enjoy your new apparel for years to come. While shopping with us, we want you to be completely happy with the experience. If you have questions about us or our products get in touch! We hope you continue to shop with us for many years to come. The newest innovations of fabrications and designs for your custom and stock apparel. Customer service. We write up each order personally and get every detail. We consider our customers family. We make ourselves available to you 24/7. We work closely with you to ensure you get the best for less! MESH SHORTS : side seam pockets, Elasticized waist inside drawstring. 11" , 8" ,5" inseam Shorts $12.00 pr. Free Lycra sleeves or Scuff Pads per player with uniforms order. over the calf socks; $10.00 pr. If you don't see it just ask. "Debi is truly great to work with. Definitely would recommend Defender Sportz to anyone. Designs came out amazing and better than I could have ever imagined. Thank you so much. " "I love working with Defender sports, and Debi is the best to work with.That's why I keep coming back, your customer service/relations Are 100% unrivaled anywhere. You make customers feel like family, and that shows you take pride in your craft and put customers first. such a rarity in today's business world. I have used Defender for years and will continue to do so. Its always a pleasure working with Debi. Thanks for the great service and product! " #SDFL partners with #DefenderSportz for all custom League & Team apparel and merchandise. 866-798-7659 press #1 when prompted. I work directly with each and every customer making sure we have each and every detail needed to manufacture, bringing their ideas and design concepts to life. We guarantee our quality in all of our custom apparel and athletic clothing. 88 years and 3 generations of being an apparel manufacturer. Having played professional football for over 10 years, and now commissioning my own developmental league, I can say I know a thing or two about jerseys. The quality of the Defender Sportz jerseys and pants are top notch! They remind me of the quality I wore when I played in the NFL and CFL. Top that off with excellent customer service you can't go wrong. Worth every penny! As we update our website we are going to recognize the amazing businesses that have helped us to this point so far. her I get immediate feedback. Debi and her team have delivered amazing service and I look forward to our continued partnership. Thank you Debi for your support. "I love working with #DefenderSportz, and Debi is the best to work with.That's why I keep coming back, your customer service/relations & merchandise are 100% unrivaled anywhere. You make customers feel like family, and that shows you take pride in your craft and put customers first. such a rarity in today's business world. I have used #DefenderSportz for years and will continue to do so. Its always a pleasure working with Debi. Thanks for the great service and product!" 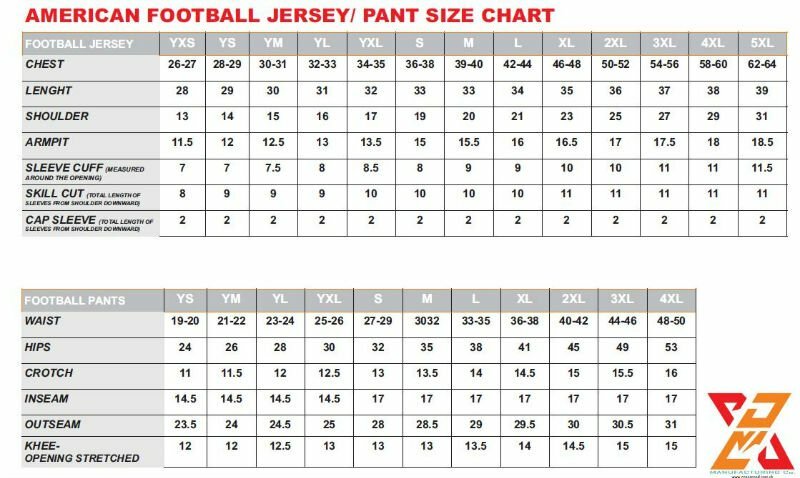 Ordering uniform for a women's tackle football team isn't easy. Especially when most uniform manufacturers garment were not designed with a woman football player in mind. After years of working with other uniform supplies I have dealt with cost mark-ups, late deliveries and even received wrong orders. I was happy to have located Defend Her Sports. I am very pleased with the overall selection, style, performance and fit of defend Her Sportswear provides for the Ventura Black Widows women's tackle football team. Defend Her Sports is made for women by women. Debi and Defender Sportz were a part of our program at Miami University while I was an Equipment Manager there. The Defend Her Sports Bra was our choice for our female athletes. The support this bra provided was preferred by most of our athletes and the cost allowed us to offer a quality product at a great price. Debi's service is exceptional. I must say this is probably long overdue and my observations mean less as each year goes by but here goes. I used Defender years ago when I couldn't find the few items we needed but no one seemed to have. Defenders scuff pads were a main stay, as were their compression shorts. Debi worked with us to make the way we felt it should be made and did a great job with it. Those items led to a collaboration on others whether we used them or not, we knew they were quality. Now in an era of large contracts when we use one company from head to toe, Defender is still out there putting quality on the field for all those teams that need it. Copyright © 2018 Defender Sportz & Defend Her Sports LLC - All Rights Reserved.